Like most people studying Russian history, I’m sure, I’ve been asked many times what drew me to the subject in the first place. I give different answers depending on my mood and the person asking. They include: TV coverage of the 1989 revolutions, which provoked lots of adolescent questions about why the Berlin Wall had been built and how politics in the communist bloc were different to those in the UK (was Gorbachev left or right-wing, I wondered); an eye-opening school trip to Moscow and St Petersburg a few years later; my passion for Anna Karenina (my well-read copy unravelling to the point it had to be carried around in what my Dad fondly called “Anna Karenina’s body bag”)… But recently I have realized that it all started much earlier. I am currently working on a project about the history of Baptist and Pentecostal communities in the former Soviet Union. One surprising discovery has been how many biographical and autobiographical texts were published in English during the final decades of Soviet power. One of these is Vanya: A True Story which tells of a young Baptist who was beaten to death for his beliefs during the period of his military service. 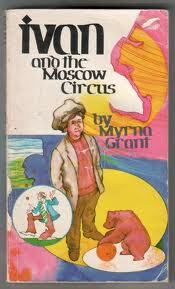 It was written in 1974 by Myrna Grant who, I discovered to my great surprise, was also the author of the “Ivan” series – children’s books I read in the 80s and loved with a passion at the time. Ivan and Katya Nazaroff are a brother and sister living in Moscow and raised by Baptist parents (although they are normally identified simply as believers or Christians). Whilst home-life is peaceful and loving, Ivan and Katya experience discrimination at school as a result of their Christian faith and their refusal to join the young pioneers. But their persecution leads to some amazing adventures. In Ivan and the Hidden Bible, students from their school are sent to work on a collective farm helping to bring in the harvest: realizing that the farm was actually the old Nazaroff home and following clues from their grandfather’s last letter before deportation in 1933, they are keen to find the family Bible. When Ivan is excluded from sporting activities and confined to the director’s office (as punishment for a misdemeanour he didn’t commit), he manages to find the treasured book. In Ivan and the Moscow Circus, the pair successfully evade KGB trails to help their friend – a young circus acrobat – spring his uncle from a psychiatric hospital where he had been forcibly restrained for writing poetry critical of the government. Ivan and the Informer recounts the dangers of Bible study for young people in Moscow. Six of the Ivan books were sent to me from a great aunt in Australia one birthday. Rereading them now, I remember how Soviet Russia had cast a spell over me long before I was interested in following current affairs or reading Tolstoy. The books were produced by a Christian publisher, Tyndale House, and meant to encourage Christian habits and values amongst young readers. But they also serve to create an image of life in the USSR. Grant’s evocative depiction of Moscow life is not unsympathetic in many ways but it is one which stresses the repressive nature of the system: KGB trails, informers, Komsomol bullies, and sneering atheist teachers. For a child, of course, the appeal is that this repressive atmosphere creates plenty of potential for adventure – and Katya and Ivan certainly had plenty of that. Aged nine or ten, living a quiet suburban life in the West Midlands, and attending our local Methodist church each Sunday without any persecution whatsoever, I felt I was surely missing out. Rereading the books this week has given me a great deal of pleasure but has also made me think anew about my journey to being an historian of the Soviet Union. 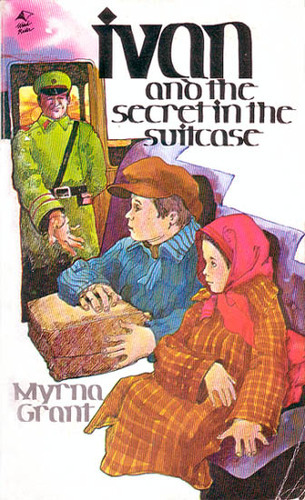 These slim volumes remind us of how the religious and the political were interconnected in the Cold War for in addition to inspiring Christian values, they encouraged young readers to think of the Soviet Union first and foremost as the place where that faith was under attack. They embody the binaries of the times: Christianity and freedom of conscience vs atheism and persecution. Whilst my decision to study Russian history was not a direct result of reading about Ivan and Katya, it certainly had an effect. Embarking on the study of Soviet history in the 1990s it was easy to see how politics had affected earlier scholarship, and in the wake of the supposed “end of history” to feel oneself free; but looking back at Ivan and Katya I realize I was much more a child of the Cold War than I had ever thought. This entry was posted in Cold War, Historiography. Bookmark the permalink. What a wonderful story! Thank you so much for sharing it! I did an undergraduate degree in Russian language and a phd in Russian history, but over the last five years I’ve come to realize that it was growing up in Cold War America that shaped me more than anything. My research now is less about the Soviet Union than it is about American perceptions of Russia. I’ve become increasingly interested in a transnational Cold War cultural history, as I have become fascinated by the similarities in the narratives that Americans and Soviets created about one another as good guys and bad guys. First and foremost, I must say that this was an excellent article. It’s odd but I have an interest in Russian/USSR history myself, and I plan to study it on the side throughout my college years (Which, in all honesty, will equal a grand total of 8, as I plan to go to seminary.) However, I must ask you something. As an individual who, along with their history, is also very interested in the history of the faith during those harsh times under the Soviet rule, when will this study of yours about the Baptist and Pentecostal faiths be complete? Is it in the forms of articles or, better yet, a book? Randi, I’m very interested in the connection between Cold War fears and biblical ideas about the end of the world so your experience is fascinating. Flynn, work on the monograph is slower than I had hoped – perhaps because I get distracted re-reading books from childhood! I have an article coming out in the journal Russian Review next year, though. In the meantime, I would certainly recommend Walter Sawatsky’s Soviet Evangelicals Since World War II and for the earlier period, Coleman’s Russian Baptists and Spiritual Revolution, 1905-1929. Good luck with your studies!